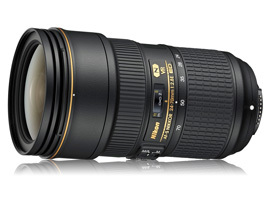 With both the old $1797 Nikon 24-70mm f/2.8G and the new $2397 Nikon 24-70mm f/2.8E currently available in the Nikkor lineup, the latest version brings a number of feature updates. As denoted by the E in the name, the new 24-70mm f/2.8E includes Nikon’s electromagnetic diaphragm, which the manufacturer claims enables more consistent exposures during high-speed continuous burst shooting. Another improvement is the addition of Nikon’s four-stop vibration reduction (VR) system to counteract the effects of camera shake when shooting hand-held at relatively slow shutter speeds. Designed specifically for Nikon full-frame DSLRs, the versatile 24-70mm focal range offers wide-angle through to short telephoto shooting options, making it a convenient all-in-one option for a range of photographic subjects. The new lens is also compatible with Nikon DX-format DSLRs, such as the D7200, although with an equivalent 36-105mm focal range on such APS-C sensor cameras, it isn’t quite as versatile. If you’re after a standard-zoom DX lens, however, better options such as the $1497 AF-S Nikon DX 17-55mm f/2.8G IF-ED are available. Along with the updated feature set, the Nikon 24-70mm f/2.8E boasts a new optical arrangement of 20 elements in 16 groups, compared to 15 elements in 11 groups on the original. We’ll see in a moment if this has improved its lens metrics, but it has certainly increased the overall size and weight of the lens — now around 20% heavier than its predecessor at 1070g, and 21mm longer at 154.5mm, not to mention $600 more expensive, too. 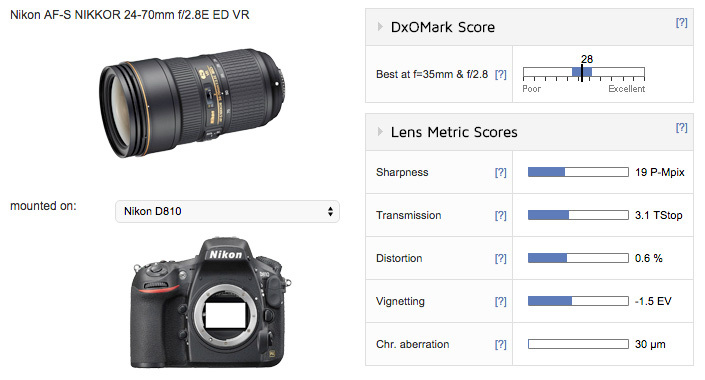 With an overall DxOMark score of 28 points, the Nikon 24-70mm f/2.8E is the 11th-highest ranked zoom lens we’ve tested on the 36Mp Nikon D810. Out of four 24-70mm standard zooms tested on the D810, the new Nikon 24-70mm f/2.8E ranks in 3rd place behind its predecessor, the Nikon 24-70mm f/2.8G, and the third-party Tamron SP 24-70mm f2.8 Di VC USD. In fact, out of the four, the new 24-70mm f/2.8E records the lowest sharpness score of 19 P-Mpix, compared to 21 or 22 P-Mpix for the standard zoom competition. 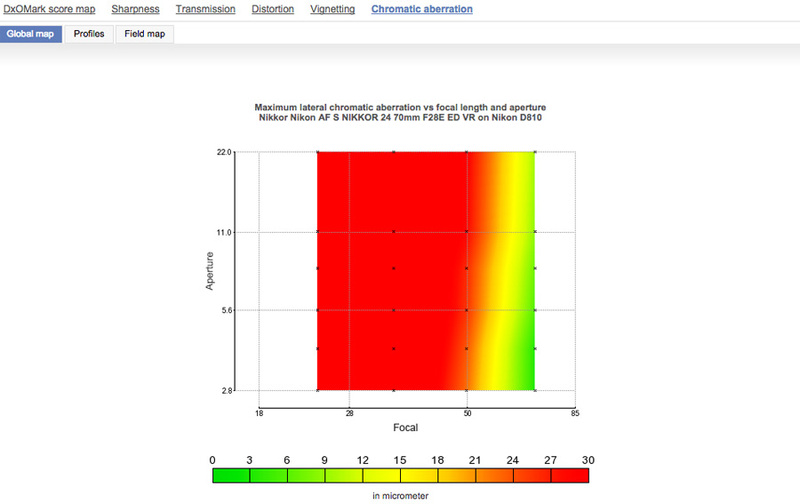 Its distortion score is also a little down in this group, but the new lens does offer comparable vignetting and chromatic aberration results to the 24-70mm competition. Chromatic aberration was one of the weakest aspects of the original 24-70mm f/2.8G lens, and while the new f/2.8E version offers a slight improvement, it’s still a problem at most settings. At 70mm, there are improvements, with little or no fringing evident at any aperture setting, but at all other focal lengths it’s more problematic. 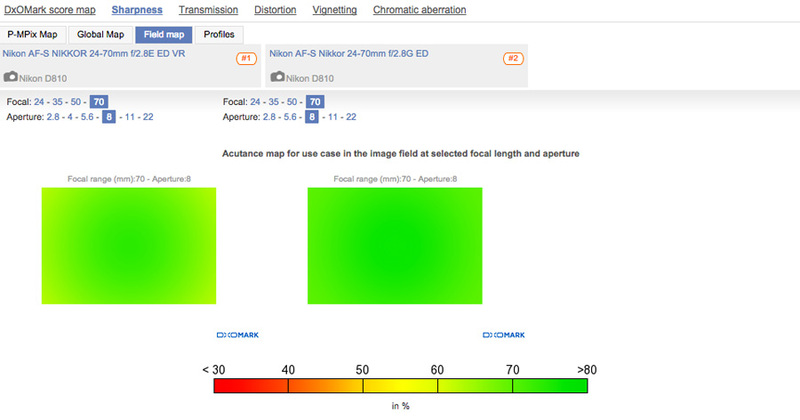 As you can see from the chromatic aberration global map below, you will need to do some post-production correction of RAW image files when shooting at focal lengths between 24 and 50mm at any aperture setting. 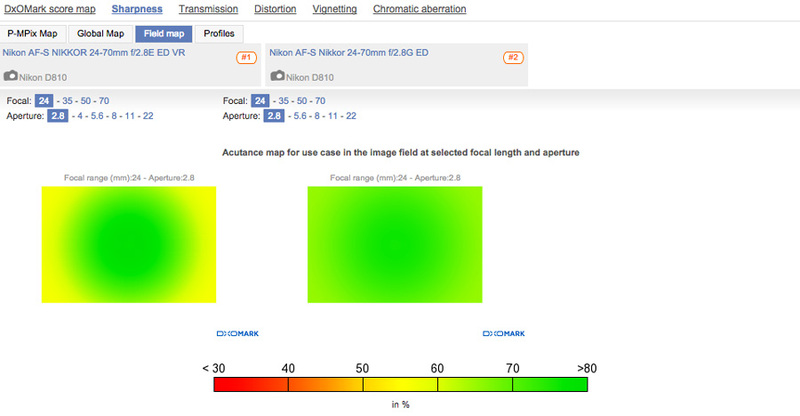 Despite the slight regression in the overall DxOMark score for Nikon’s updated 24-70mm f/2.8E standard zoom, most lens metrics remain similar to those of its predecessor. As noted, however, sharpness is lower on the 24-70mm f/2.8E at 19 P-Mpix compared to 21 P-Mpix for the original 24-70mm f/2.8G. At 24mm, sharpness on the new 24-70mm f/2.8E is strong in the center of the frame, particularly between f/2.8 – f/11, but it doesn’t deliver the same level of resolution in the corners. At 70mm f/2.8, a popular setting for portraits on a standard zoom, results are only really good right in the center, with heavy edge softness apparent at this setting, which is a step backwards compared to its predecessor. Close down the aperture to f/5.6 or f/8 at 70mm, and edge sharpness is much better on the 24-70mm f/2.8E, but again, it’s not quite as strong as the original 24-70mm f/2.8G version at the same settings. A popular zoom size for many full-frame shooters, there’s ample competition for Nikon standard zoom lenses, with both Sigma and Tamron having options on the shelves. At just $799, the Sigma 24-70mm f/2.8 IF EX DG HSM offers internal focus (IF) and autofocus motor (HSM) for quick and quiet AF, but no image stabilization system. The $1299 Tamron 24-70mm f/2.8 Di VC USD features all of the above as well as image stabilization – Vibration Reduction (VC) in Tamron speak – making it a very similar proposition to the new Nikon standard zoom. 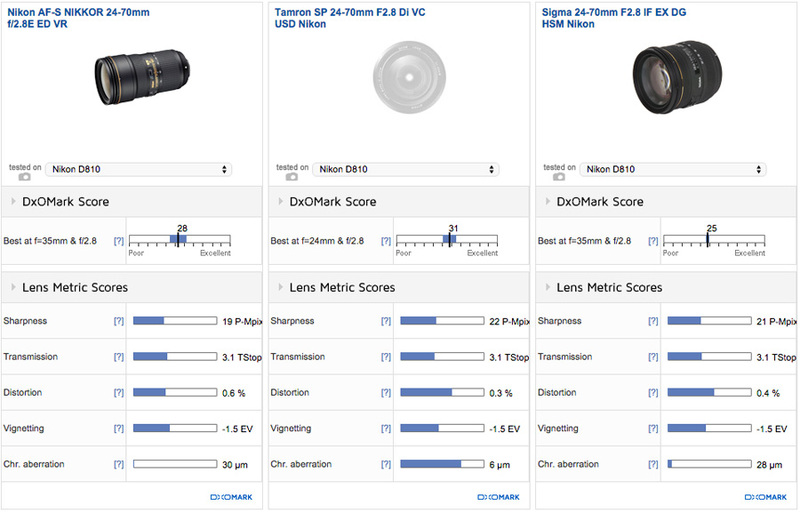 In terms of our DxOMark sensor scores, the Tamron 24-70mm f/2.8 wins overall with a DxOMark Score of 31 points compared to 28 for the Nikon 24-70mm f/2.8E in second place, and the Sigma 24-70mm in third with 25. 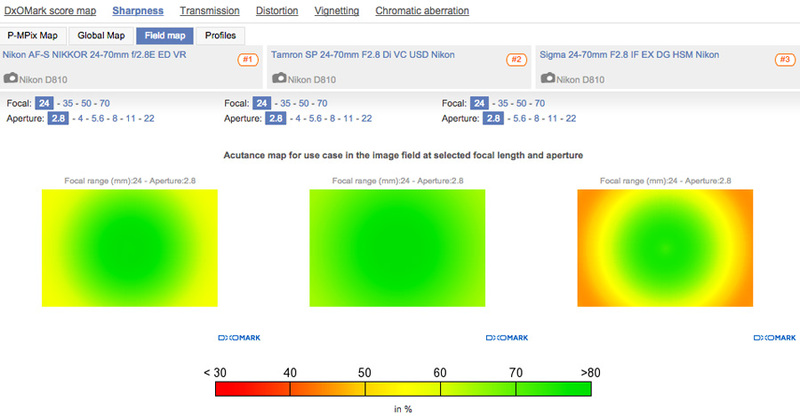 Lens metrics among the three for transmission, distortion and vignetting are pretty similar, so it’s down to sharpness and chromatic aberration to separate them. For sharpness, the Tamron wins with a sharpness score of 22 P-Mpix against 21 for the Sigma in second and 19 for the Nikon in third. At the maximum f/2.8 aperture the Tamron offers better edge sharpness at 24mm, and although still not great at 70mm, it’s marginally better than the Nikon and Sigma. At mid- apertures of f/5.6 or f/8, both the Tamron and the Nikon standard zooms offer good resolution in the center, but sharpness on the Tamron 24-70mm extends further into the corners of the frame. 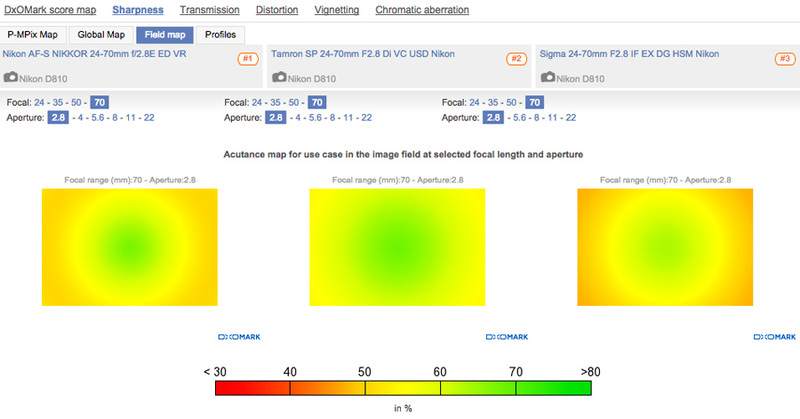 For chromatic aberration, the Tamron is in a different class, with its score of just 6µ far ahead of both the Nikon and Sigma on 30µ and 28µ, respectively. 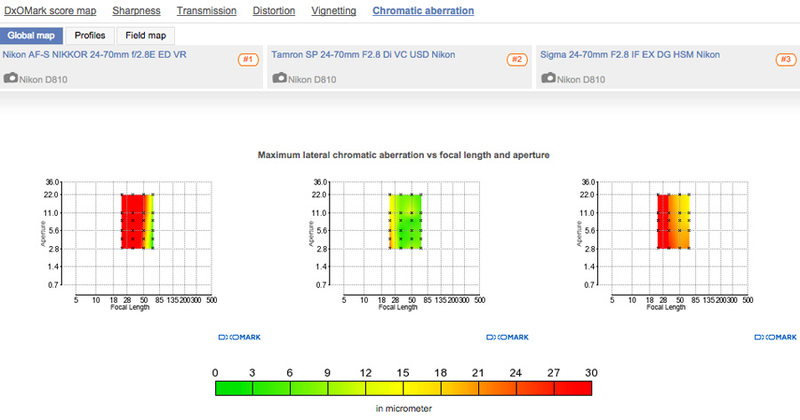 The global map indicates that while chromatic aberration at 24mm on the Tamron isn’t great between 28 – 70mm, it’s obviously superior to that of the Nikon and the Sigma. But what seems to be a complete redesign of the optical system has made an already bulky lens even bigger and heavier, which is a serious consideration if you’re looking for an all-in-one lens to carry around a lot. At $2,397, it’s pretty expensive, too — in fact, $600 more than the original G-type version and a whopping $1,100 over the Tamron 24-70mm f2.8 Di VC USD third-party equivalent. 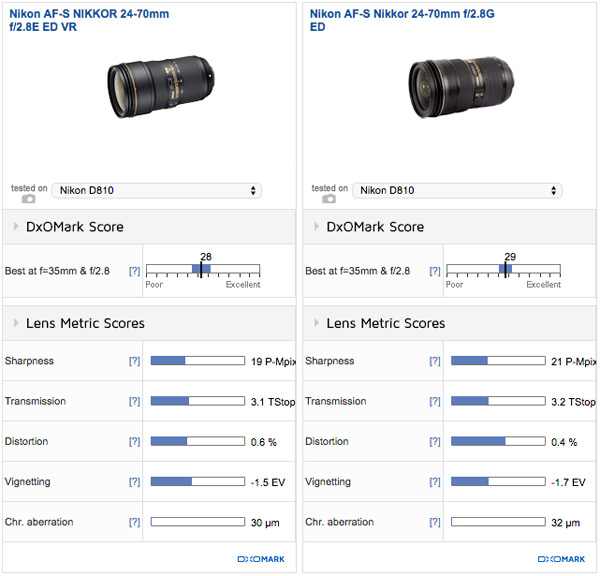 Perhaps all of that could be forgiven if the new Nikon 24-70mm f/2.8E had raised the bar for optical performance, but as we’ve seen from its DxOMark scores, this disappointingly isn’t the case. 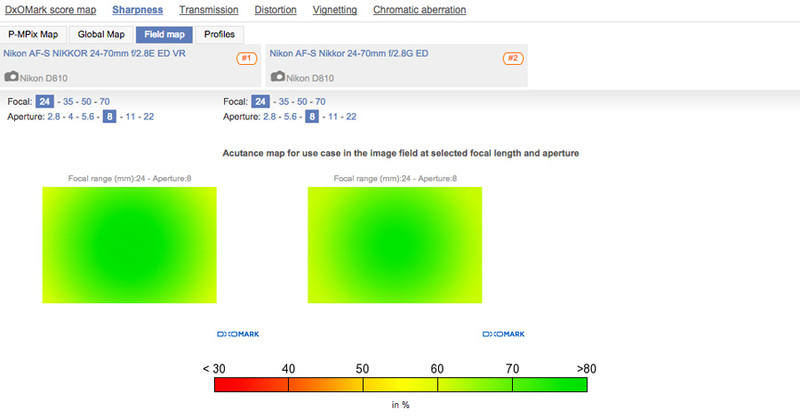 Overall sharpness is down compared to its predecessor and slightly worse at the critical setting of f/2.8. 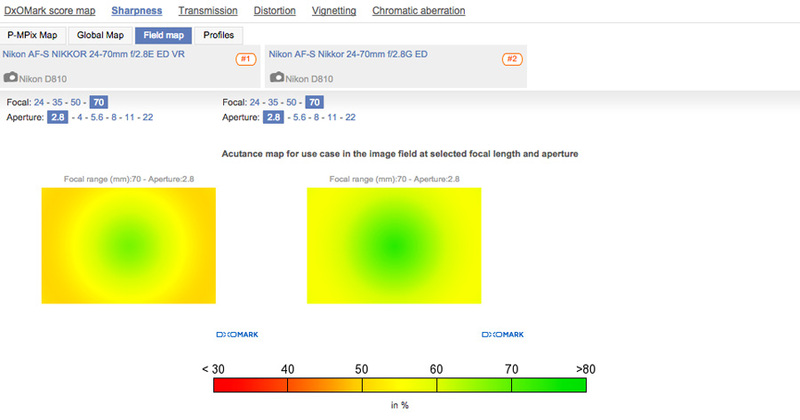 While chromatic aberration has been improved slightly, it’s still far from good at the wider focal lengths.